Despite developments in current psychiatric treatment options, there is no significant increase in rates of treatment adherence. Inadherence in psychiatric disorders is higher than the other diseases. Lose of insight, drugs’ side effects, sociodemographic features, personality traits clearly influence the treatment adherence. Determining and overcoming the factors negatively affecting treatment adherence for each disorder will help to prove adherence and reduce the treatment costs and hospitalization. Günümüzde artan tedavi seçeneklerine rağmen, hastaların tedavi uyumunda gözle görülür bir artış saptanmamıştır. Psikiyatrik bozukluklarda tedavi uyumsuzluğu diğer hastalıklardan daha yüksek orandadır. İçgörü kaybı, ilaçlara bağlı yan etkiler, sosyodemografik özellikler, kişilik özellikleri, eşlik eden hastalıklar gibi birçok faktör bireylerin tedavi uyumunu olumsuz etkilemektedir. Her hastalık için tedavi uyumunu bozan faktörlerin saptanması ve giderilmesi tedavi uyumunu arttırmakla birlikte, tedavi masraflarını ve hasteneye yatış sayısını azaltacaktır. Adams J, Scott J (2000) Predicting medication non-adherence in severe mental disorders. Acta Psychiatry Scand, 100:119-124. Aker T, Çıtak S, Ceyhanlı A, Sarılgan C, Taştan U, Ögel K, Özmen E (1994) Hasta yakınlarının ilaç tedavisine karşı tutumu. 30. Ulusal Psikiyatri Kongresi Poster Bildirisi, 9-14 Eylül 1994, Nevşehir. Aker T, Üstünsoy S, Kuğu N, Yazıcı A (2000) Psikotik bozukluğu olan hastalarda tedaviye uyum ve ilaç tedavisine uyumsuzluğu değerlendirme ölçeği. 36. Ulusal Psikiyatri Kongresi Özet Kitabı. Antalya. Altamura AC, Mauri M (1985) Plasma concentrations, information and therapy adherence during long-term treatment with antidepressants. Br J Clin Pharmacol, 20:714–716. Ateş MA, Algül A (2006) Bipolar bozukluklarda tedavi uyumsuzluğu. Türkiye Klinikleri Dahili Tıp Bilimleri Dergisi Psikiyatri, 2(29):60-64. Axelrod S, Wetzler S (1989) Factors associated with better compliance with psychiatric aftercare. Hosp Community Psychiatry, 40(4):397-401. Connelly CE, Davenport YB, Nurnberger JI (1982) Adherence to treatment regimen in a lithium carbonate clinic. Arch Gen Psychiatry, 39:585-588. Çobanoğlu ZSÜ, Aker T, Çobanoğlu N (2003) Şizofreni ve diğer psikotik bozukluğu olan hastalarda tedaviye uyum sorunları. Düşünen Adam, 16:211-218. Danion JM, Neunreuther C, Krieger-Finance F, Imbs JL, Singer L (1987) Compliance with long-term lithium treatment in major affective disorders. Pharmacopsychiatry, 20(5):230-1. Davidson JRT, Meltzer-Brody SE (1999) The underrecognition and undertreatment of depression: what is the breadth and depth of the problem? J Clin Psychiatry, 60(Suppl 7):4-9. Demirkol ME, Tamam L, Evlice YE, Karaytuğ MO (2015) Psikiyatri hastalarının tedaviye uyumu. Cukurova Medical Journal, 40:555- 568. Dencker SJ, Liberman RP (1995) From compliance to collaboration in the treatment of schizophrenia. Int Clin Psychopharmacol, 9(Suppl) 5:75-78. Dilbaz N, Karamustafalıoğlu O, Oral T, Önder E, Çetin M (2006) Evaluation of compliance to treatment and factors affecting compliance for schizophrenia outpatients. Klinik Psikofarmakoloji Bulteni, 16:223-232. Ervatan SÖ, Özel A, Türkçapar H, Atasoy N (2003) Depresif hastalarda tedaviye uyum: doğal izlem çalışması. Klinik Psikiyatri Dergisi, 6:5-11. Fenton WS, Blyler CR, Heinssen RK (1997) Determinants of medication compliance in schizophrenia: empirical and clinical findings. Schizophr Bull, 23:637:651. Frank E, Prien RF, Kupfer DJ, Alberts L (1985) Implications of noncompliance on research in affective disorders. Psychopharmacol Bull, 21:37-42. Goodwin FK, Jamison KR (1990) Manic Depressive Illness. Oxford, Oxford University Press. Gutiérrez-Casares JR1, Cañas F, Rodríguez-Morales A, Hidalgo-Borrajo R, Alonso-Escolano D (2010) Adherence to treatment and therapeutic strategies in schizophrenic patients: the ADHERE study. CNS Spectr, 15:327-337. Issakidis C, Andrews G (2004) Pretreatment attrition and dropout in an outpatient clinic for anxiety disorders. Acta Psychiatr Scand, 109:426-433. Jamison K, Akiskal H (1983) Medication compliance in patients with bipolar disorders. Psychiatr Clin North Am, 6:175-192. Jamison KR, Gerner RH, Goodwin FK (1979) Patient and physician attitudes toward lithium: relationship to compliance. Arch Gen Psychiatry, 20;36(8 Spec No):866-869. Johnson R, McFarland B (1998) Lithium use and discontinuation in a health maintenance organization. Am J Psychiatry, 57:292- 297. Keck P, McElroy B, Strakowski S (1998) Factors associated with pharmacologic noncompliance in patients with mania. J Clin Psychiatry, 57:292-297. Keck PE, McElroy SL, Strakowski SM, Bourne ML, West SA (1997) Compliance with maintenance treatment in bipolar disorder. Psychopharmacol Bull, 33:87-91. Kültür S, Mete L (1997) Şizofreni. In Psikiyatri Temel Kitabı (Eds E Köroğlu, C Güleç). Ankara, Hekimler Yayın Birliği. Lacro JP, Dunn LB, Dolder CR, Leckband SG, Jeste DV (2002) Prevalence of and risk factors for medication nonadherence in patients with schizophrenia: a comprehensive review of recent literature. J Clin Psychiatry, 63:892-909. Lingam R, Scott J (2002) Treatment non-adherence in affective disorders. Acta Psychiatr Scand,105:164-172. Loffler W, Kilian R, Toumi M, Angermeyer MC (2003) Schizophrenic patients’ subjective reasons for compliance an noncompliance with neuroleptic treatment. Pharmacopsychiatry, 36:105-112. Mitchell AJ, Selmes T (2007) Why don’t patients take their medicine? reasons and solutions in psychiatry. 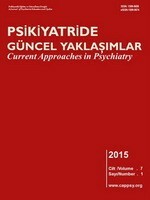 Advances in Psychiatric Treatment, vol. 13:336–346. Noble LM (1998) Doctor-patient communication and adherence to treatment. In Adherence to Treatment in Medical Conditions (Eds LB Myers, K Midence):51-82. Amsterdam, Harwood Academics. Olfson M, Mechanic D, Hansell S, Boyer CA, Walkup J, Weiden PJ (2000) Predicting medication noncompliance after hospital discharge among patients with schizophrenia. Psychiatr Serv, 51:216-222. Owen RR, Fischer EP, Booth BM (1996) Medication noncompliance and substance abuse among patients with schizophrenia. Psychiatr Serv, 47:853-858. Perkins DO (2002) Predictors of noncompliance in patients with schizophrenia. J Clin Psychiatry, 63:1121-1128. Rakel RE (1999) Depression. Prim Care, 26:211-224. Rusch N, Corrigan PW (2002) Motivational interviewing to improve insight and treatment adherence in schizophrenia. Psychiatr Rehabil J, 26:23-32. Rush AJ (1999) Strategies and tactics in the management of maintenance treatment for depressed patients. J Clin Psychiatry, 60(Suppl 14):21-26. Sajatovic M, Levin J, Fuentes-Casiano E, Cassidy KA, Tatsuoka C, Jenkinsc JH (2011) Illness experience and reasons for nonadherence among individuals with bipolar disorder who are poorly adherent with medication. Compr Psychiatry, 52:280– 287. Schumann C, Lenz G, Berghöfer A, Müller-Oerlinghausen B (1999) Non-adherence with long-term prophylaxis: a 6-year naturalistic follow-up study of affectively ill patients. Psychiatry Res, 89:247-57. Scott J (2000) Predicting medication non-adherence ın severe affective disorders. Acta Neurolopsychiatr, 12:128-130. Smith J, Birchwood M (1990) Relatives and patients as partners in management of schizophrenia. The development of a service model. Br J Psychiatry,156:654-660. Sönmez EU (2008) Şizofreni hastalarında dönerkapı fenomeni değişkenlerinin incelenmesi (Uzmanlık tezi). İstanbul, Bakırköy Prof. Dr. Mazhar Osman Ruh Sağlığı ve Sinir Hastalıkları Eğitim ve Araştırma Hastanesi. Swartz MS, Swanson JW, Hiday VA, Borum R, Wagner HR, Burns BJ (1998) Violence and severe mental illness: the effects of substance abuse and nonadherence to medication. Am J Psychiatry, 155:226-231. Thase ME, Rush AJ (1997) When at first you don't succeed:sequential strategies for antidepressant nonresponders. J Clin Psychiatry, 58(Suppl 13):23-29. Trauer T, Sacks T (2000) The relationship between insight and medication adherence in severely mentally ill clients treated in the community. Acta Psychiatr Scand, 102:211-216. Tunca Z, Hancıoğlu M (1993) Hastaların psikiyatriste devamını etkileyen etmenler. Turk Psikiyatri Derg, 4:219-223. Valenstein M, Blow FC, Copeland LA, McCarthy JF, Zeber JE, Gillon L et al. (2004) Poor antipsychotic adherence among patients with schizophrenia: medication and patient factors. Schizophr Bull, 30:255-264. Van Putten T (1974) Why do schizophrenic patients refuse to take their drugs? Arch Gen Psychiatry, 31:67-72. Mehmet Emin Demirkol, Uzm.Dr., Çukurova Üniversitesi, Adana; Lut Tamam, Prof.Dr., Çukurova Üniversi- tesi, Adana.